When James Makowski pleaded guilty to drug possession in 2010, he agreed to enter a 120-day boot camp as punishment. He figured it wouldn’t be as bad as the boot camp he completed when he entered the U.S. Marines. But instead of boot camp, James ended up serving two months in a maximum security prison in Pontiac, Ill.
Makowski’s fingerprints were submitted to an FBI database and later shared with the homeland security department’s Automated Biometric Identification System. His name was flagged and an immigration “detainer” was issued. The problem is that Makowski is a U.S. citizen. Now the Chicago-area resident is suing the FBI and Homeland Security, becoming the first U.S. citizen to challenge Secure Communities–the federal program that helps local authorities identify potentially undocumented immigrants. Makowski was born in India. He was adopted by an American family when he was 4 months old. The family moved around the country before settling in Illinois. Makowski became a naturalized U.S. citizen at age 1, but the government did not update his immigration records, according to Mark Fleming, attorney with the Chicago-based National Immigrant Justice Center. Under Secure Communities, fingerprints of anyone arrested by local law enforcement agencies are submitted to the FBI and are later shared with DHS. Makowski’s lawsuit was filed last week in U.S. District Court of Northern Illinois and it argues that the FBI and Department of Homeland Security violated the Privacy Act, which restricts what information may be passed between government agencies, every time they share fingerprints from people who are not suspected of an immigration violation, according to the lawsuit. Immigration officials deny having violated the Privacy Act. “The information-sharing partnership between the Department of Homeland Security and the FBI serves as the cornerstone of Secure Communities, and fulfills a mandate required by federal law. This information sharing does not violate the Privacy Act. U.S. Immigration and Customs Enforcement is evaluating the allegations contained in the lawsuit; however, we do not comment on pending litigation,” officials said in a prepared statement. The Secure Communities program was designed to find and deport dangerous criminals, but a Chicago Reporter investigation found that many of the undocumented immigrants in Illinois being placed in deportation proceeded had no criminal record. 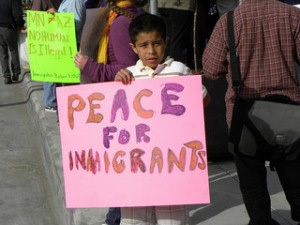 In Illinois, 46 percent of 3,023 people who were booked into immigration custody under Secure Communities between Nov. 24, 2009, and July 25, 2011, were never charged with, or convicted of, the crimes for which they were arrested, according to the Reporter’s analysis of the U.S. Department of Homeland Security records. Another 29 percent were charged with one misdemeanor, which in many cases stemmed from a traffic violation, before being taken into immigration custody, the analysis shows. But immigration officials say the Secure Communities program has been successful at identifying dangerous criminals. Local immigration officials say Secure Communities helped find a 23-year-old undocumented immigrant last month in Lake County. His record shows that he had a previous conviction for human smuggling in Arizona in 2008, according to Gail Montenegro, spokeswoman for the enforcement agency. But Fleming of the National Immigrant Justice Center says Makowski and other U.S. citizens are at risk. “U.S. citizens are a vulnerable population to Secure Communities,” he said. Makowski said he just hopes his experience is not repeated, and wants the lawsuit to change the system. This entry was posted in Press (Illinois) on July 9, 2012 by Ian.